Various other tourist attractions in Junagadh are the Mahabat Maqbara, Durbar Hall Museum and Narsinh Mehta's Choro. 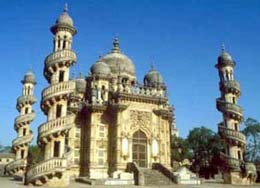 Mahabat Maqbara is a stunning mausoleum of one of the Nawabs of Junagadh. This mausoleum was built in 1892 and resplendent with silver doors and intricate architecture, including minarets encircled by spiraling stairways. Narsinh Mehta's Choro is a great revered place where the great poet and saint Narsinh Mehta used to hold his assemblies, religious discourses and Bhajans in the 15th century. There is a small temple of Gopinath and the idol of Shri Damodar Raiji and Narsinh Mehta. Narsinh Mehta was one of the great poets of India. He was a great devotee of Lord Krishna and a scholar, philosopher and a social reformer.